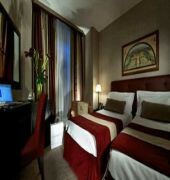 200 meters from Piazza di Spagna, 150 meters from Fontana di Trevi in a suggestive and valuable street of ancient Rome. In a few minutes walking distance to places of artistic attraction and the best boutiques of the capital - in Via Condotti, Via Frattina, Via del Babuino and many more . 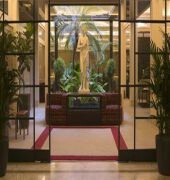 In one of the most beautiful and unique to the city in a '800 palace between Piazza di Spagna and Fontana di Trevi, the hotel occupies expresses the attractiveness and atmosphere of a secret Rome. Is more than a hotel .It is an extraordinary refuge for those who love peace and quiet. And right in the most vivid and authentic center of the capital, within walking distance of all . a prized location for a hotel of charm, elegant and timeless *** NOTE: LOCAL RATE: 3 EUROS PER PERSON AND DAY TO PAY IN THE HOTEL . The Dei Borgognoni is a Tourist hotel. Located in ROME area. Shopping is accessible by bus/taxi and the nightlife/restaurants are located in the hotel. Descriptionclass="small" style="text-align: justify; font-size:11px;">200 meters from Piazza di Spagna, 150 meters from Fontana di Trevi in a suggestive and valuable street of ancient Rome. In a few minutes walking distance to places of artistic attraction and the best boutiques of the capital - in Via Condotti, Via Frattina, Via del Babuino and many more . 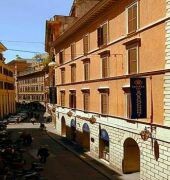 In one of the most beautiful and unique to the city in a '800 palace between Piazza di Spagna and Fontana di Trevi, the hotel occupies expresses the attractiveness and atmosphere of a secret Rome. Is more than a hotel .It is an extraordinary refuge for those who love peace and quiet. And right in the most vivid and authentic center of the capital, within walking distance of all . 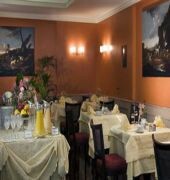 a prized location for a hotel of charm, elegant and timeless *** NOTE: LOCAL RATE: 3 EUROS PER PERSON AND DAY TO PAY IN THE HOTEL .